Right now I’m working on what to wear for my overnight flight to London. I’ve got pretty much everything packed that I’m planning to take, with the exception of my workout clothes and the pieces I brought to California with me that I also plan to pack. I’m all about comfort when traveling, but I definitely don’t want to look like a slob. I want to step off the plane looking fresh and fab! I tend to freeze on planes, so I’ll likely land on some sort of soft sweater and legging combo. This is my go-to pair of leggings, because they’re on the thicker side (they would not be mistaken for workout pants) and somewhat high-waisted. I’ll likely pair them with my favorite Rag & Bone boots that are polished while still being the most comfortable (and easy to remove at airport security) boots I own. A few lightweight sweaters I’m considering for the journey include this Rebecca Taylor pullover, this open-sleeve Milly sweater, or this twisted Zimmermann sweater. All three are super cute and would be perfect to go from the flight to whatever my first activity in London may be! Love these posts of yours! If so nice that you think about us at any age :) Each set is pretty awesome! The Rosetta Getty cardigan is beautiful! Your trip is coming up so soon! You must be getting excited!! Going to be such an adventure, can’t wait to see your posts! These are great outfits! I am in my 20s but I would actually wear all of the above. Love all of your travel styles! I freeze on planes too, so if I am ever wearing sandals on a plane, I always pack some cozy socks to wear during the flight and to put on for security. Love these posts, Merritt. So well done. Bookmarking this! 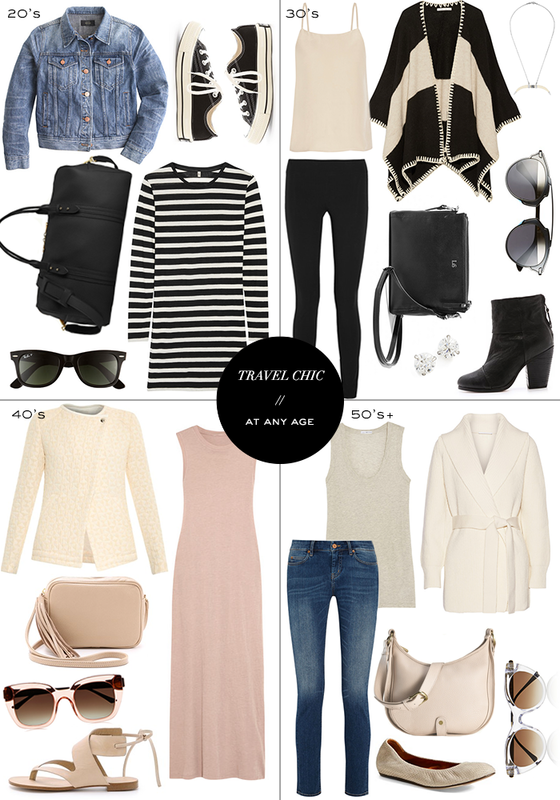 Perfect travel packing pieces! Lol, I always go for the 30’s outfit when you post these! Love all of your picks, especially the ones for my age 50’s! Would wear all of them! Even I’m in my late 20’s I love all of the looks!!! Enjoy London! !